He set out with his begging bowl pleading for little and he failed even to get that! David Cameron asked little of consequence in his original begging letter to the EU to obtain a new and revised relationship between Britain and the EU. Cameron’s request was realistically insignificant and designed to provide a duplicitous fudge to convince the British they should ‘REMAIN’ in the EU. Clearly David Cameron’s efforts have ended in abject failure, even surrendering Britain’s democratic right to decide who might enter Britain and blocking economic migrants from the EU – surrendering decision making to the political heads of 27 foreign countries unelected by Britain in denial of any and all economic and political sense and against any democratic principle by any rational decision. IF David Cameron’s failure is dressed to seem like some kind of achievement and public money is used to dupe the ill informed to vote to ‘Remain’ in the EU – Cameron’s legacy will be to condemn Britain to ever increasing insignificance and economic ruin at the hands of our competitors in the EU under the direct rule of unelected foreign bureacrats. A period of pain and loss of self respect and global significance as a trading nation, conducted in obscene distortion of the fundamental human right of self determination. Such a catastrophic outcome would lead to yet more years of unrest and dissatisfaction pending ever increasing efforts of the informed populace to achieve a dignified EXIT in the future, an eXit then negotiated from a weakend position, a position fundamentally undermined by the ‘FUDGE’ of David Cameron’s duplicitous EU Referendum. And so it came to pass that Donald Tusk, President of the European Council, published in Brussels, his “proposal for a new settlement for the United Kingdom within the European Union”. Together with Tusk’s letter setting out the outline of the settlement, the key document is the Draft Decision of the Heads of State or Government, meeting within the European Council, “concerning a New Settlement for the United Kingdom within the European Union”. If approved, it “shall take effect on the same date as the Government of the United Kingdom informs the Secretary-General of the Council that the United Kingdom has decided to remain a member of the European Union”. But, what does it offer us? In the first of the so-called “baskets” – Section A on “economic governance” – it will be recalled that Mr Cameron asked Mr Tusk on 15 November that, if the eurozone countries decided to take measures to secure the long-term future of their currency, they would nevertheless “respect the integrity of the Single Market, and the legitimate interests of non-Euro members”. In Mr Tusk’s response of today, he acknowledges that, in order to fulfil the Treaties’ objective to establish an economic and monetary union whose currency is the euro, “further deepening is needed”. That is the euro-speak for a new treaty. Restating the obvious, Tusk goes on to say that further deepening the economic and monetary union “will be voluntary for Member States whose currency is not the euro and will be open to their participation wherever feasible”. On the other hand, it is acknowledged that Member States not participating in the further deepening of the economic and monetary union “will not create obstacles to but facilitate such further deepening while this process will, conversely, respect the rights and competences of the non-participating Member States”. When it comes to the detail, we actually get six substantive points, which prohibit discrimination between euro and non-euro areas and a requirement that legal acts, including intergovernmental agreements between Member States, directly linked to the functioning of the euro area “shall respect the internal market or economic, social and territorial cohesion, and shall not constitute a barrier to or discrimination in trade between Member States”. In another of these provisions, the Council notes that the implementation of measures, “including the supervision or resolution of financial institutions and markets, and macro-prudential responsibilities”, to be taken in view of preserving the financial stability of Member States whose currency is not the euro “is a matter for their own authorities, unless such Member States wish to join common mechanisms open to their participation”. However, while this is all good stuff, Mr Cameron called for “legally binding principles that safeguard the operation of the Union for all 28 Member States – and a safeguard mechanism to ensure these principles are respected and enforced”. Instead of this, he has actually got:[7. The substance of this Section will be incorporated into the Treaties at the time of their next revision in accordance with the relevant provisions of the Treaties and the respective constitutional requirements of the Member States. ]The square brackets are in the text, which indicates text which has yet to be approved. So even in this draft document, we are dealing with a provisional statement. And that, itself, is very, very far from being unequivocal. Crucially, this requires treaty revision and there is no treaty revision on the stocks. Thus the European Council is saying that at some unspecified time in the future, it will be included in a new treaty draft – assuming the then constituted Council agrees to be bound by the decision of its predecessor. It must then be agreed unanimously by all Member States – which the European Council has no means of enforcing – and it must then be ratified by all 28 Member States. In other words, there are no “legally binding principles that safeguard the operation of the Union for all 28 Member States”. Nor is there any legally enforceable “safeguard mechanism” to ensure these principles are respected and enforced. All Mr Cameron has is an unenforceable political statement from the current European Council, which hasn’t even been approved yet. From the list of successes, therefore, scratch any idea of “economic safeguards”. Missing out the virtually irrelevant Section B on “competitiveness”, we skip to “Section C” which deals with sovereignty, the third of the so-called “baskets”. Here, though, the European Commission is not addressing sovereignty, per se, but the British Government’s concern at the continued inclusion in the treaties of the term “ever closer union”. First, I want to end Britain’s obligation to work towards an “ever closer union” as set out in the Treaty. It is very important to make clear that this commitment will no longer apply to the United Kingdom. I want to do this in a formal, legally-binding and irreversible way. From this, there can be no doubt that Mr Cameron is being unequivocal, especially in terms of wanting “a formal, legally-binding and irreversible” commitment from the European Union. It is recognized that the United Kingdom, in the light of the specific situation it has under the Treaties, is not committed to further political integration into the European Union. Once again, the square brackets indicates text which has yet to be approved. We are again dealing with a provisional statement. This, then, is another issue which requires treaty revision, so the European Council is not able to give us a “legally-binding and irreversible” commitment from the European Union. In other of his “baskets”, all Mr Cameron has is another unenforceable political statement, which hasn’t even been approved yet. From the list of successes, therefore, scratch “ever closer union”. Turning next to the much vaunted “red card”, this refers to Mr Cameron’s desire to enhance the role of national parliaments, “by proposing a new arrangement where groups of national parliaments, acting together, can stop unwanted legislative proposals”. The precise threshold of national parliaments required, he wrote, “will be a matter for the negotiation”. Typically, the media in its usual ignorant way, has fallen for the trap of believing that something substantial has been offered by the EU. Taking this at face value, for instance, the Financial Times argues that “allowing the parliaments of member states to reject EU legislation could be a significant boost for national sovereignty if a sufficient number of legislatures decide to play the ‘red card'”. But the idea that national parliaments are to be given any powers at all to reject EU legislation at will is sheer moonshine. This is an elaborate and cruel deception. What in fact is on offer is an extension of Protocol 2, already in the Consolidated Treaties, relating to subsidiarity, a provision that William Hague once dismissed as so weak that even if the European Commission proposed the slaughter of the first-born it would be difficult to employ it. Currently, as it stands, if a third of all the votes held by national parliaments are cast in favour of a complaint that a legislative proposals fails to conform to the principle of subsidiarity, then the draft must be reviewed. And after that review, the Commission may, if it so chooses, amend or withdraw the draft. Now here’s the thing. We are dealing with a very, very limited scenario. It is restricted to a situation where a draft law fails to comply with the principle of subsidiarity. This applies only to areas where the EU does not have exclusive competence, whence the Union “shall act only if and in so far as the objectives of the proposed action cannot be sufficiently achieved by the Member States, either at central level or at regional and local level, but can rather, by reason of the scale or effects of the proposed action, be better achieved at Union level”. The number of occasions when this can be invoked is actually very small – twice since 2009 when the provision came into force. Where reasoned opinions on the non-compliance of a draft Union legislative act with the principle of subsidiarity, sent within 12 weeks from the transmission of that draft, represent more than 55 % of the votes allocated to the national Parliaments, the Council Presidency will include the item on the agenda of the Council for a comprehensive discussion on these opinions and on the consequences to be drawn therefrom. Following such discussion, and while respecting the procedural requirements of the Treaties, the representatives of the Member States acting in their capacity as members of the Council will discontinue the consideration of the draft legislative act in question unless the draft is amended to accommodate the concerns expressed in the reasoned opinions. If this sounds slim, consider the Protocol as it already stands, which states that “if by a majority of 55 percent of the members of the Council or a majority of the votes cast in the European Parliament, the legislator is of the opinion that the proposal is not compatible with the principle of subsidiarity, the legislative proposal shall not be given further consideration”. What is on offer, therefore, is nine-tenths of nothing – a very slender enhancement of a provision that takes very little power from the Union. The bulk of legislation, which covers areas of exclusive competence, is entirely untouched by this provision, and then the only ground for rejection is a failure to conform with the principle of subsidiarity – which in itself is notoriously difficult to sustain. Even then, while this is not specifically stated, to introduce this non-provision, amendments to Protocol 2 will be required, and since the protocol itself is an integral part of the treaty, that amounts to a commitment to treaty change – which is not yet forthcoming. The proposal is a charade. Effectively, this is the biggest confidence trick of them all. The so-called “renegotiations” over the ability of the UK to suspend certain benefit payments to migrant workers are actually nothing of the sort. The UK, in a roundabout way, is simply invoking the pre-existing safeguard measures set out in Articles 112-3 of the EEA Agreement. While there has been much loose talk about Norway’s supposed lack of influence in the EEA, it in common with any EFTA state, can take such measures unilaterally but, as Article 113 of the Agreement states: “For the Community, the safeguard measures shall be taken by the EC Commission”. Thus, all the UK can do is petition the European Commission, which will now consider a proposal to amend Regulation (EC) No 492/2011 on freedom of movement for workers within the Union, which will then set in train the administrative provisions for invoking Article 112. The European Commission considers that the kind of information provided to it by the United Kingdom shows the type of exceptional situation that the proposed safeguard mechanism is intended to cover exists in the United Kingdom today. Accordingly, the United Kingdom would be justified in triggering the mechanism in the full expectation of obtaining approval. So what this wonderful “new deal” amounts to is the agreement that the UK that can trigger an EEA treaty provision which has been in existence since 1992, “in the full expectation of obtaining approval” to control payments of British taxpayers’ money to citizens of other EU Member States. In other words, the UK is being told that it is justified is asking permission to control benefit payments to migrant workers and, all things being equal, might expect the Commission to give it permission to do so. That’s real influence for you. However, as we see from the main “decision” this permission will have a limited duration and apply only to EU workers newly entering its labour market during a period of [X] years, extendible for two successive periods of [Y] years and [Z] years. In other words, there the four years which Mr Cameron has pleaded for is not foreseen in this deal, it can only apply to new migrants, and will be time-limited, with the actual timings yet to be agreed. 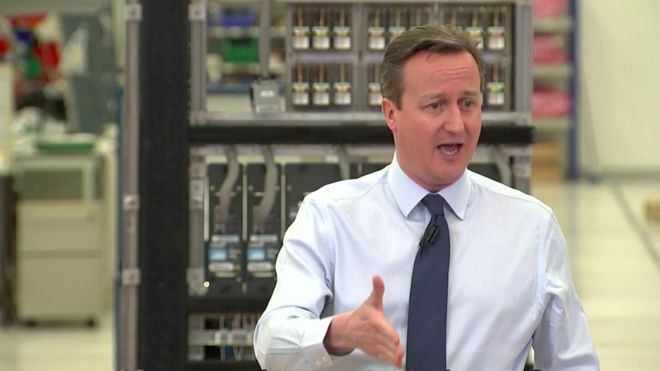 And overall, Mr Cameron says, this draft deal delivers “substantial reforms”. It actually does no such thing. Next Next post: David Cameron Aspires To Emulate The Image Of Neville Chamberlaine!